(Bloomberg) -- 3M Co. eased investor concerns over global growth as the diversified manufacturer struck an optimistic tone for its overseas business. Organic sales rose in all geographic regions at the end of 2018, excluding the effect of a strong U.S. dollar, 3M said in a statement Tuesday as it reported earnings. While the company acknowledged a slowdown in China, the broad-based growth helped it top Wall Street’s expectations for both sales and profit in the fourth quarter. The maker of Post-it notes avoided calamity as investors braced for weakness following warnings this week from Caterpillar Inc. and Nvidia Corp. that the trade war with China is weighing on results. Caterpillar saw its worst sell-off in seven years Monday. 3M, a bellwether company with operations ranging from health-care supplies to consumer electronics to industrial products, generates more than half of its sales outside the U.S.
3M rose 3.1 percent to $199.18 at 9:37 a.m. in New York. 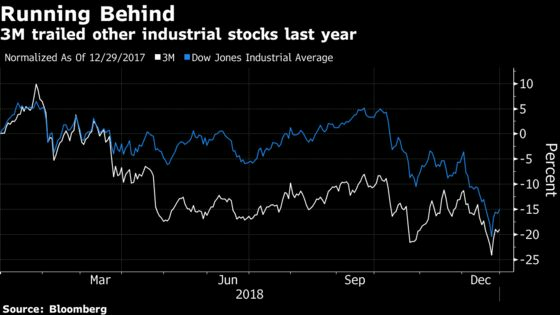 The shares fell 19 percent last year, worse than the 15 percent slide in a Standard & Poor’s index of industrial stocks. The company said adjusted profit in the fourth quarter rose to $2.31 a share, topping the $2.28 average of analysts’ estimates compiled by Bloomberg. Sales of $7.95 billion also beat expectations, even as 3M said foreign-currency translation reduced revenue by 2.3 percent. Including the currency effects, sales rose 3.3 percent in the U.S. while falling in other geographic regions, 3M said. On an organic, local-currency basis, revenue increased in all regions, including a 2 percent expansion in Asia-Pacific. Earnings in 2019 will be $10.45 to $10.90 per share, down 15 cents from the prior range, the company said. That included a 10-cent headwind from a previously announced acquisition. 3M also trimmed the bottom of its sales forecast. Chief Executive Officer Mike Roman, speaking on a conference call with investors and analysts, attributed the revenue forecast change to “slowing in key end markets,” including China and the automotive and electronics sectors.